Still sorting out the lumber for the top. Not quite the full reveal I was hoping for, but wanted to at least show the progress so far. 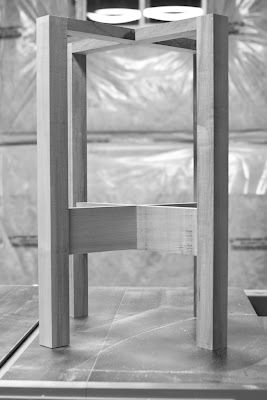 It's based upon the Gustav Stickley 603 Tabouret from the Spring 2008 issue of Woodworking Magazine. I skipped the detailing on the lower stretchers. The lap joint was cut a bit tight so the dry fit turned into a press fit. Hopefully the joint doesn't crack. Overall, I'm reasonably happy with the first effort. There are gaps here and there but I guess that's to be expected. After all, I've been doing this for all of 8 or 9 months, most of which has been spent setting things up and practicing basic handtool skills. Some notes on the construction. There are two sets of lap joints, one on each set of stretchers. Given the differences in geometry, the two were quite different to actually cut. The top joint has a greater floor surface than wall surface. This meant that small alignment errors with the chisel resulted in defects on the floor of the lap joint. For the lower joint, the floor surface was relatively small, with a very deep wall. So this placed a greater emphasis on sawing to the line as compared to chiseling out the small bit of waste. Overall, I would say the M&T joints were the simplest to cut, but the most time consuming. Part of this was due to the intermissions to sharpen the mortising chisel, not having a proper workbench on which to hammer out the mortises and overly frequent checking and clearing out of the waste. Chiseling out mortises on a tablesaw's extension table has the effect of turning the table into a large impromptu drum. Needless to say, late evening mortising ceased to become an option. By the last mortise, it was taking me about 25 minutes to chisel one out. It's a good thing that I don't need these things to feed the family. It seems 2-3x longer than I would think is reasonable for a 1/4" x 1 1/2" x 7/8" mortise, even excepting that the wood is hard maple. I think I did a reasonable job on the shoulders, the tenon itself fit well into the mortise, but I'd say 3 of the 8 shoulder to face surfaces show some gapping. Nothing glaring and something that will get better as I keep at it. I didn't enjoy cutting the half-blind pins. The tails were straightforward enough. Still need a bit more consistency with the shoulders. Cutting the sockets is a huge pain. I'm not sure if I was doing this properly, but the result was okay. I switched between knifing the lines and drawing the lines with a pen. Results were a tight fit with the knifed lines and a sloppy one with the pen. Mentally I don't sit far enough to the waste side with the pen lines. The result tends to have no pen line remaining where there should be the entire line showing after I'm done. I used a mortise chisel to hog out most of the waste, and switched to a bevel edge chisel to clean up along the edges. Keeping the floor flat wasn't as difficult as I was expecting. Small surfaces are nice that way.